Commercial flea treatments may be harmful to senior cats. Dealing with cat fleas is rarely easy, but it's especially hard with senior cats. Commercial treatments usually include toxic chemicals that, even under ideal circumstances, have potential side effects. Pair that with your aging cat's weakened immune system and you've got the potential for a litany of health problems. It probably started with incessant scratching. Then you took a closer look at your cat and spotted those telltale white and brown flecks (eggs and waste, respectively). You may've even caught the little buggers redhanded (so to speak) while they dined on your cat's blood. It's tempting to start flea treatments immediately, but talk to a vet first. 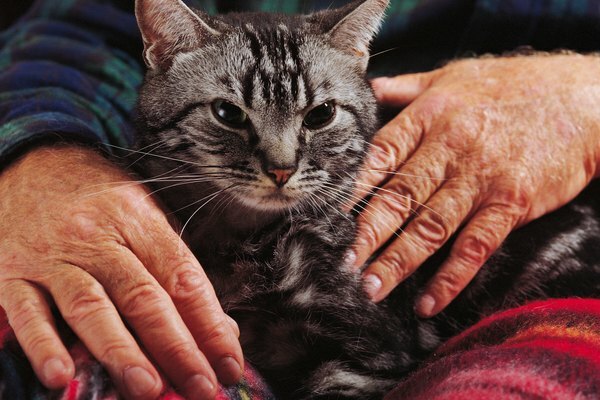 Aging cats sometimes develop subtle chronic health issues that complicate treatments. Often, older cats lose their sense of smell, reducing their appetite and, by extension, their overall health. Aging cats have weaker immune systems, which means the poisons in most products that kill fleas can also harm them. Whether you grab a dip, powder, spray or shampoo off the shelf, carefully read the label of all commercial flea treatments. The chemicals you want to avoid are organophosphates, which includes amitraz, fenoxycarb, permethrin, propoxur and tetrachlorvinphos (aka TCVP). According to the Natural Resources Defense Council, these chemicals, even when used as instructed, can cause "serious health consequences to pets and humans." Some products should be avoided for all cats, regardless of age. These include products with pyrethroids, according to a WebMD vet who claims many fleas are resistant to this class of insecticide. Furthermore, don't use products formulated for dogs, as some of them contain chemicals poisonous to cats. Your vet can prescribe safer flea treatment products than those that line the shelves of most supermarkets and pet stores. Newer products, mostly pills, are much less toxic. Most work by lacing your cat's blood with a chemical that, once ingested by adult fleas, prevents their eggs from developing. As fleas age and die—within two months, usually—no new fleas are around to continue the infestation. Your aging cat will have to deal with some itching if you use this method (technically, it's an allergic reaction to the saliva that accompanies flea bites), but he won't face potential toxicity from insecticides. Help your cat by brushing him with an unmedicated flea comb to thin the herd. In addition to treating your aging cat, make sure you vacuum your house, especially carpet and furniture, and wash your cat's bedding weekly. A change in routine affects any cat, but older cats appear more slavish to habit, so don't turn their world upside down with obsessive cleaning. Be thorough, quick and efficient. Alternative flea treatments include peppering your cat's food with brewer's yeast to make his blood unpalatable, or using citronella, rosemary and wormwood scents to drive away the fleas. Methodology aside, it's important to stop flea infestations. In addition to the obvious skin problems they create, fleas also are vectors for tapeworms and other diseases that can devastate an aging cat. Ark Animals: Flea Control Secrets—Do You Need Flea Treatment for Indoor Felines? CatChannel.com: How Did My Indoor Cat Get Fleas? Do People Who Own Cats Really Live Longer? Do Cats Increase the Life Expectancy of Humans? What Does It Mean When a Dog Won't Stop Whining & Licking the Air ? What is the Best Cabinet Surface to Withstand Cat Urine?